It's time to preorder! Many Japanese stores are now listing the game with confirmation that they'll offer the 'early reservation' exclusive DLC weapons, so we should see import stores clarifying their listings over the next few days. Towels as part of a special bundle: e-Capcom only. A first press bonus weapon for Ashikaga Yoshiteru: available everywhere in limited quantities (if you qualify for the 'early reservation' weapons you should definitely receive this too). Four 'early reservation' exclusive DLC weapons which change a character's element: selected stores only. A 'registration complete' smartphone/PC wallpaper of the game's box art: selected stores only. A store-specific smartphone/PC wallpaper: selected stores only. 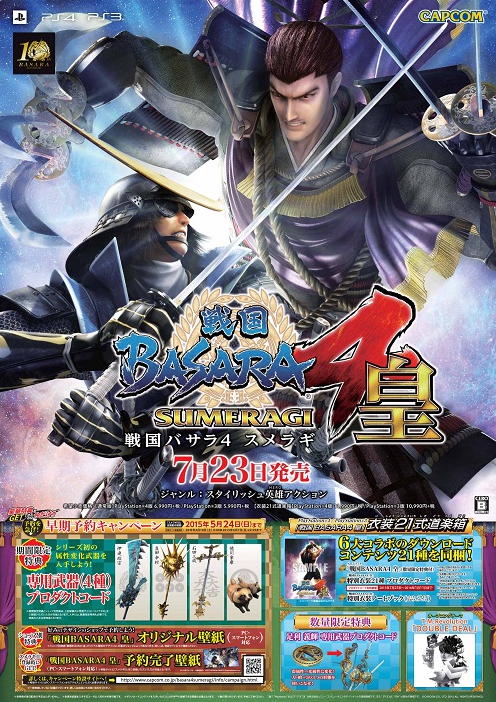 I'll be keeping an up-to-date list of stores in my Sengoku Basara 4 Sumeragi master post so please check there if you need the latest information. Once you've placed your order and received your Sumeragi ID registration code from the seller, visit this special link to register it on Capcom's site. Remember, the deadline for qualifying for a Sumeragi ID is 24th May 2015 and you need to register it on Capcom's website by 7th June 2015 if you want to receive the rewards. I've started writing a simple walkthrough here and I'll add more details when I've registered a code myself (or been sent screenshots) since I don't know what happens next! Keep your Sumeragi ID somewhere safe; you'll need it again later to access your DLC codes when the game is released. Capcom will not replace lost codes. If you don't receive your Sumeragi ID after preordering, please contact your place of purchase as quickly as possible and show them this page. If they aren't able to send you the Sumeragi ID on time and you really want those DLC weapons or wallpapers, you should cancel and reorder at a store which is confirmed to be providing the codes. Even if you register your Sumeragi ID too late to qualify for the 'early reservation' weapons or store-specific wallpaper, you'll still be able to download the standard 'reservation complete' bonus wallpaper if you register it online before 23:59 on 22nd July 2015. Capcom has planned a series of events at five gaming stores across Japan from 9th May 2015 in order to let fans try out Sengoku Basara 4 Sumeragi, Dai Gyakuten Saiban -Naruhodou Ryuunosuke no Bouken- and Devil May Cry 4 Special Edition ahead of their release dates. There will be talk shows at each store hosted by Sengoku Basara and Devil May Cry executive producer Kobayashi 'KobaP' Hiroyuki and Gyakuten Saiban producer Kojima Shintarou, and they'll also be signing goods and meeting the fans face to face if they've reserved one of the three games at the same store. The talk shows promise to feature the latest news about the games and a different video will be debuted in each venue. The talk shows will start at 12:00 and last for half an hour, then there will be signings until 13:00 and gameplay trials for the participants until the events close at 17:00. Tickets will be handed out from 11:00 on the day of each event on a first come, first served basis. You can see the original article on the Famitsu and 4Gamer websites. From my experiences at similar events I'd guess that the demonstrations will be strictly supervised so there won't be any filming or story spoilers. However, we might still hear a few new rumours about the gameplay once the first event has taken place since fans are being encouraged to tweet their impressions live from the venue to earn a smartphone wallpaper. The videos are likely to appear online a few days after each event. 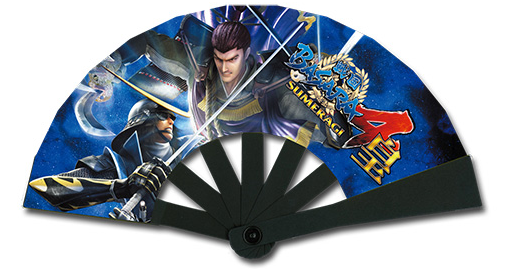 Great, looks like it's time to get moving and pester Play-Asia as much as possible to get my Basara ID. Good luck getting your Basara ID too, you deserve it, also all the towels. Hahaha, it would be so nice if things worked that way!